Parotitis is swelling in one or both of the parotid glands. 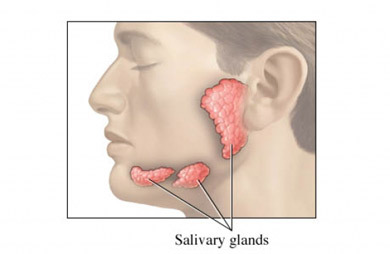 These are two large salivary glands that are inside each cheek over the jaw in front of each ear. You will be asked about your symptoms and health history. A physical exam will be done. This may be enough to make a diagnosis. Tests may include a blood test and a fluid sample from the parotid gland. Flossing once a day and brush your teeth at least twice a day to help with healing. Warm salt-water rinses can help keep the mouth moist. Increasing saliva flow may be all that is needed to remove a mucus plug or small stone. This may be done by sucking on a sour candy. If that is not helpful, the doctor may need to remove a stone, tumor, or other blockage with surgery. Practice good oral hygiene to prevent acute parotitis. Acute suppurative parotitis. EBSCO DynaMed Plus website. Available at: https://www.dynamed.com/topics/dmp~AN~T115829/Acute-suppurative-parotitis . Updated June 28, 2018. Accessed July 18, 2018. Cain A. Parotitis. Net Doctor website. Available at: http://www.netdoctor.co.uk/conditions/mouth-and-teeth/a3082/parotitis. Updated March 10, 2005. Accessed July 18, 2018. Chitre VV, Premchandra DJ. Review: recurrent parotitis. Arch Dis Child. 1997;77(4):359-363. Wilson KF, Meier JD, Ward PD. Salivary gland disorders. Am Fam Physician. 2014;9(11):882-888.